If you’re looking for a cannabis theme for WordPress, CannaBiz is exactly what you need and today’s updates will help solidify CannaBiz as the #1 cannabis theme on the market! Today we’re releasing version 1.4 of our CannaBiz WordPress theme; built for dispensaries and delivery services, but versatile enough for any business in or out of the cannabis industry. After our last round of updates, the main goal for this release was to give you more control over what fonts are being used for titles and body text. So the plan was to utilize the WordPress Theme Customizer Controls from Paul Underwood and to an extent CannaBiz does use it. Right before release, we ran into an issue where the cached fonts weren’t displaying properly. Instead of relying on a cached version of the Google Fonts, the customizer control was stripped out to it’s bare bones minimum and some of the top font choices were manually added. 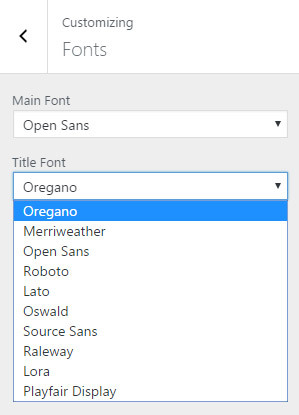 Now you’re able to choose from some of the top Google Fonts as well as a few defaults like Arial, Helvetica and Georgia. Want a font that’s not currently added? Submit a support ticket and let us know! More than a handful of CSS updates have been added to this release. Everything from added styles for Topicals and Growers archive pages to making the price amounts displayed throughout WooCommerce the default CannaBiz green. There’s also updates for the CSS to fix an issue with the page titles displaying with a dark gray on single page view, rather than the color chosen in the Customizer. We not only want to make CannaBiz the #1 cannabis theme on the market, we also want to give you a complete package when using our a variety of our products. Because of this, if you use our WooConnect add-on, the buttons for “View Details” and “Buy Now” are also now controlled via the button color options in the Customizer. Download the #1 cannabis theme for WordPress now! If you’ve already purchased the CannaBiz WordPress theme, you’ve received version 1.4 in your email inbox. Purchase your copy of the #1 cannabis theme for WordPress today! Want CannaBiz plus all of our commercial add-on’s? Grab our All in one bundle!